While 2000’s WCW is synonymous with storyline absurdity and embarrassment, 2001 showed graces of promise with the faint smell of overbooking evident. 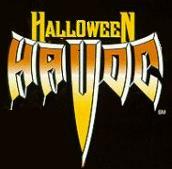 Gone now were Goldberg and Hulk Hogan, but stars like Lex Luger, Ric Flair and Kevin Nash were still prominent as ever. Flair plays the role of “evil boss” quite well actually. What also helps this show move along is the breakthrough stars like Diamond Dallas Page (DDP) and the evolution of WCW World Heavyweight Champion Scott Steiner into “Big Poppa Pump,” almost unrecognizable from his look just a few years prior. Picture Chad Gable becoming Braun Strowman and that was Steiner in a nutshell. This poster actually plays into Steiner’s “I rushed the legends out” heel character as he boasted victories over Sting, Booker T, Goldberg and Sid Vicious. The last edition of Superbrawl won’t have anything you’ll find if you’re on the search for WCW’s mark on the industry, but it was a nice tease of what could’ve been had they stuck around a bit longer. If a tagline ever fit a World Championship Wrestling show, this was it. 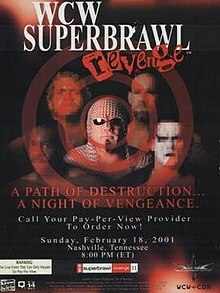 Uncensored – WCW’s attempt to bend the rules and present an “extreme” Pay-Per-View with only gimmicked matches, was an experiment in the beginning. Headlined by a Leather Strap Match between WCW World Heavyweight Champion Hulk Hogan and WCW United States Heavyweight Champion Vader in the midst of a hot feud between Hogan and “A Man Possessed,” Ric Flair, it was enough to salvage for the rest of the malarky. What malarky? Put in a “Boxer Vs. Wrestler” Match, a “King Of The Road” Match and a “Martial Arts” Match. Oh and because of recent creative changes, no blood was allowed at all. 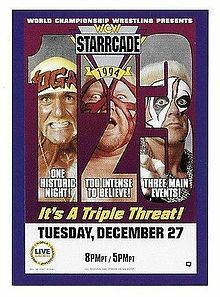 Known as World Championship Wrestling’s proverbial “answer to WrestleMania” from the then-World Wrestling Federation, Starrcade was always about making history and was aptly placed where a “payoff” Pay-Per-View should be – the end of December. It’s only fitting that all the big storylines would come to a halt here, naturally. Oh wait – not in 1991. Ha. What were you thinking there? In Ric Flair’s absence, WCW appeared to put a lot of faith in its biggest draw, the blonde-haired, face-painted babyface Sting, as he sought the World Heavyweight Championship. As an obstacle, he had to go through not only Lex Luger, but as well as a group called The Dangerous Alliance, consistent of members like Rick Rude, “Stunning” Steve Austin (who had blonde hair of his own, that’s how old this show is) and were led by none other than Paul E. Dangerously, who we now know as Paul Heyman. Come join us for this 1990’s-tastic journey.